In a well run palm oil mill, it is expected that each 100 tonnes of FFB processed yields 20 to 24 tonnes of crude palm oil and about 4 tonnes of palm kernels. Thus between 72 to 76 percent of the FFB comes out at various stages of the process as waste. In the large- and medium-scale mills the above-mentioned waste products are all put to economically useful purpose. They could therefore be referred to as by-products rather than waste products. Wet, empty bunches are partly dried in the sun and later used as fuel. Another economic use for the empty bunches is to return them to the plantation as a mulch to enhance moisture retention and organic matter in the soil. The palm kernel shell is also used as a source of fuel for the boilers. Unfortunately the shell contains silicates that form a scale in the boilers if too much shell is fed to the furnace, thus limiting the amount of shell that can be utilised in the boilers. Residual shell is disposed of as gravel for plantation roads maintenance. Blacksmiths also buy the shells to use as fuel material in their casting and forging operations. Palm nut shell is also used in the preparation of pozzolana, a cement substitute material that has been developed by the Kwame Nkrumah University of Science and Technology, Kumasi, Ghana. The fibre recovered from the nut/fibre separation stage is a good combustible material and finds ready use as fuel to boil the fruit. (Fig. 22) The fibre constitutes the bulk of material used to fire the large boilers used to generate superheated steam to drive turbines for electrical power generation in large-scale plants. Boiler ash is recycled as fertilizer and factory floor cleaning agent. The potash in the ashes reacts with the oil to form a weak potash soap that is washed away with water. Small-scale mills also use the fibre and bunch waste as fuel material. Most small-scale mills do not undertake the shelling of recovered palm nuts. The nuts are sold to palm kernel processors. 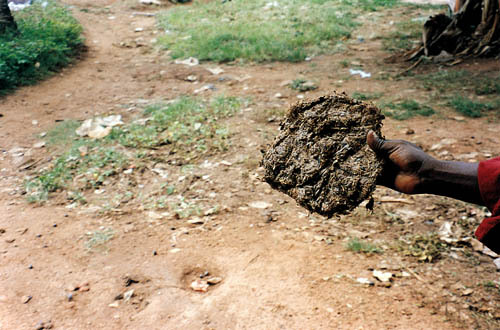 Small-scale palm kernel processors use clay baths to separate kernels from shells. The shells are normally left in a pile to dry. Some of the shells are used for fuel but there are always residual amounts found around the palm kernel processing centres. Periodically the pile is removed and used as landfill. Wood consumption of small-scale operations is relatively small because of the recycling of the fibre and bunch waste as the main fuel source. The medium-scale operators tend to supplement their internally generated solid waste fuel sources with wood for firing their boilers. The impact on the local tree population is significant enough to cause factories to close while foraging for wood supplies. Large- and medium-scale mills produce copious volumes of liquid waste from the sterilizer, clarifying centrifuges and hydrocyclones. This effluent must be treated before discharge to avoid serious environmental pollution. Liquid waste treatment involves anaerobic fermentation followed by aerobic fermentation in large ponds until the effluent quality is suitable for discharge. In some of the mills the treated effluent is used on the farm as manure and source of water for irrigation. The sludge accumulating in the fermentation ponds is periodically removed and fed to the land. To manage the amount of oil entrained in the effluent, while at the same time improving the efficiency of oil recovery, the large mills use de-watering and decanting centrifuges at various locations in the process line. When it comes to liquid waste management most traditional processors and small-scale palm oil processors do not adhere to any environmental protection practices. The environmental awareness level of the operators in this industrial area is low. Indeed much is desired of the hygiene of most facilities. Traditional processors operate so close to nature that they simply return liquids to the surrounding bushes. The discharged quantities are so small that the ground easily absorbs the waste matter and the operators have not yet seen their activities as injurious to their surroundings. However in the more organized intermediate technology mills sludge from the clarifying tanks are carried in buckets or rudimentary gutters to sludge pits dug in the nearby bushes. When the sludge pit begins to give off a bad odour the pit is filled in and another one dug for the purpose. Charcoal from the cooking fires is dumped into the pits to absorb some of the odour. Sometimes the oil in the sludge pit is recovered and mixed with fibre to make a fire-starting cake called flint. It has been observed that when the small-scale mill operators empty their sludge on the surrounding bushes the bushes slowly die. Operators say they use the sludge as a herbicide to clear their surroundings. It is, however, time to develop simple inexpensive aqueous pollution control systems for small-scale operators. Environmental pollution considerations in small-scale palm oil milling need concentrated attention as this industrial segment assumes greater importance. It is hoped that as more educated people come into the industry they will bring increased awareness and a greater commitment to adopt improved environmental management practices in their operations.